Not Rated – This program contains material that may not be appropriate for all viewers. Viewer discretion is advised. 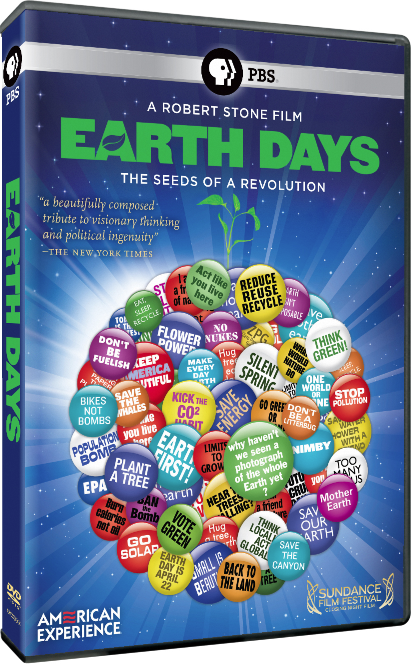 Earth Days DVD Review By John C.
A good documentary will take a subject that you may or may not be interested in and keep you watching – make it interesting. A lesser documentary will take an important, fascinating subject and make it boring. In example, Earth Days. Which drew back memories of The 11th Hour and Waterlife – two other documentaries preaching extremely valid messages that fell into the same trap. Earth Days traces back to the origins of the environmental movement, and the installation of Earth Day in 1970. We see interviews with those who started the movement, who, with their sometimes radical ideas, are also the ones who likely encouraged the backlash. Although this theory is barely touched upon. The film is sometimes powerful, but usually tedious. The archival footage is interesting, but not tied together well enough to make it all interesting in one sitting. Although it may be interesting in parts, Earth Days is just far too long to sustain itself, despite a Michael Giacchino score and a Cat Stevens song over the end credits. The DVD includes writer/director Robert Stone’s first film Pollution, 1972, as well as audio commentary with Stone. Earth Days DVD Review By Erin V.
While I am interested in environmental documentaries, this is not one that held my attention. By half way in, I checked the clock, expecting to be at least an hour in – no such luck. I found my mind wandering, and rather than retaining the facts this film had to offer, I was counting the minutes left. I think it tried too hard to sustain itself with too many facts one after another, with no breathing room in between. After several people talking, about what they think, in a row, I just wanted to maybe see something that would actually make me think of the environment. I find a film like Disney•Nature’s Earth last year to be far more thought-provoking about our world, letting us marvel in the beauty we need to protect rather than how governments screw up. While there were a few nature shots – and they were postcard images that stuck in my mind – they just appeared and left, more like editing fillers than ties to the actual film. Don’t get me wrong, there were some interesting facts and revelations here (mainly regarding US political decisions), but while I find informative films interesting, this was not presented in a way that I could possibly retain much of it at all. A documentary that originally aired on PBS, Earth Days tells the history of the modern environmental movement. Through archival clips, and interviews with famous American environmental founders, this film takes us from the afluential 1950’s, to the more socially conscious 1970’s. While Earth Days could have been a good documentary, it drags on far too long to hold ones attention. Best to rent this one and watch it in parts over a series of days. On April 22nd, 2010 Earth Day will be 40 years old. Earth Days is an interesting documentary that chronicles the environmental activism journey that began in the 1960’s U.S.A. Told through personal testimony of many of the people involved and old news archives it traces the influence that the different American presidents had on the environmental cause. Would North America look different today had Jimmy Carter won the presidency over Ronald Reagan in 1979? While this documentary raises a lot of interesting issues and questions it drags on a little too long for the average viewer. Interested students may want to watch this one in segments. Michael Giacchino fans will be interested to know that he provided the score for Earth Days. The documentary is written, produced and directed by Robert Stone. Having come of age “back in the day”, I should have enjoyed the 40th anniversary documentary Earth Days a lot more than I did. The film’s use of prominent supporters from various fields as they were then and are now is admirable. The problem is that it is just boring–11th Hour boring. We were looking at our watches after 25 minutes hoping it was almost over when there was still an hour to go, and nodding off way before the end. Admittedly, the issues are just not compelling enough any more, either for overly familiar supporters, or for skeptics who would need a lot more than a documentary to convince them. However, taken in shorter segments over several classes, it can be a valuable resource for students, along with the support materials on the DVD and PBS website.